WHY DO YOU NEED A SENDOW CAR VIDEO RECORDER? As a recorder of scenery. 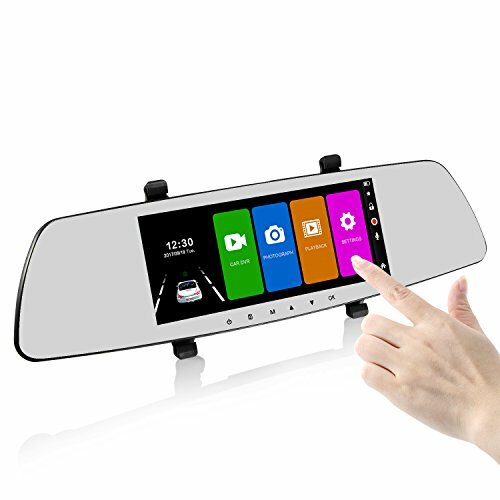 Keep perfect record while driving, the time, license plate, driving track...are recorded, so that the fleeting scenery could be preserved. As a companion of journey. You can also use it to record the process of conquering difficulties and obstacles on the road. As a parking guard. Reversing view with parking assist line provides you with security while parking, record the accident after parking wherever your vehicle is. As a justification of defense. Able to record the entire process of car driving video images and sound, showing evidence for traffic accidents. 1. Supports a SDHC Micro SD card up to 32GB, class 10 recommended. Please format TF card before using then restart. 2. Please hard wire it or connect it with an external battery when you need on parking. unplug car charger when you do not use the vehicle next. to prevent video lost, used for collision monitoring in the shutdown state. 5. Before fixed the rear camera with screwes, please confirm the vertical position, check whether the lens up/down direction is correct. 7 INCH DASH CAM - Using 7'' IPS touch screen, it is easier for you to navigate and set the multi-function menu. With the high transparency silver mirror, you can get achromatic vision. 1080p HD footage filmed through 6G sharp lenses make it the better dash camera at its price point - an ideal choice for the driver. WIDE ANGLE VIEW & SAFE PARKING - Front camera with 170° wide angle (Avoid A-pillar blind spot, increase your travel safety) + IP65 waterproof 480P rear-view camera, which presents enough wide view of lanes ahead + oncoming vehicles from behind. Connect red wire to the positive of reverse light, will auto switch over the full view and trigger guide line for safe parking when the R gear engaged. ONE-KEY SWITCHING - With one-key switching design, much convenient for you to switch the five view modes from full screen display of front/rear view or picture-in--picture display. Sendow mirror dash cam can be used as your original rearview mirror when turning off the screen. G-SENSOR & PARKING MODE - Integrated G-sensor will auto-lock recorded video file when a shark/collision detected, the locked videos will be a very important evidence to protect your interests. Triggered by parking mode, the dash cam will come to life and start recording, files are automatically marked and locked for safekeeping when detects the impact. EASY TO GET STARTED - Auto-activated to start recording when powered on. Simply fits over your existing rearview mirror and install the cable inside cabin of your vehicle and plug into car charger port (Supports 12V power supply, vehicles with 24 volt need additional buck converter.) 1-year warranty service & professional technical supports via zoeysenteam@hotmail.com for 24/7. If you have any questions about this product by SENDOW, contact us by completing and submitting the form below. If you are looking for a specif part number, please include it with your message.